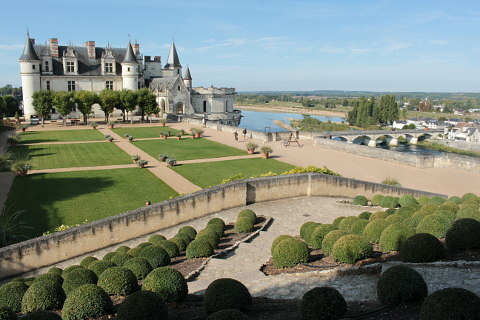 This was one of our favourite chateaux in the Loire Valley. 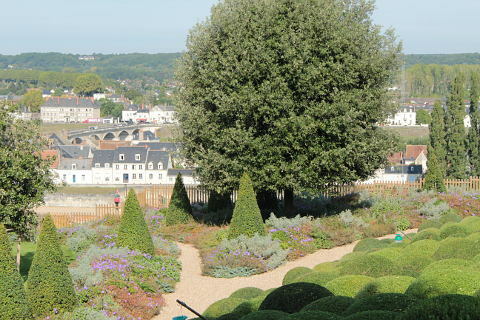 It has an attractive castle, pretty gardens and lovely views and the town of Amboise is charming too. 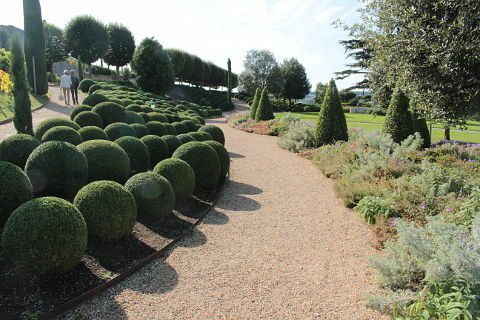 Whilst the gardens of the Chateau d'Amboise are not extensive they have been beautifully planned and are a charming mix of immaculately clipped box balls and cones and a looser infill planting that is so fashionable at the moment yet suits the historic chateau wonderfully. 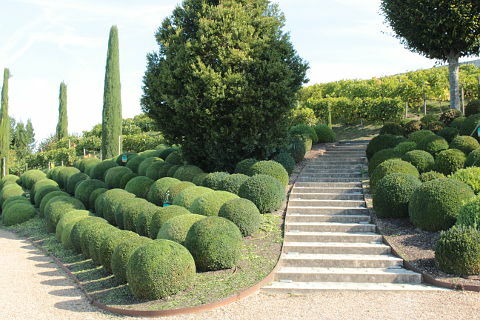 Extending in front of the chateau are symetrical lawns and paths and where the ground slopes upwards at the side and far end of the garden a river of box balls topped with clipped spherical trees gives life and drama to the slopes. 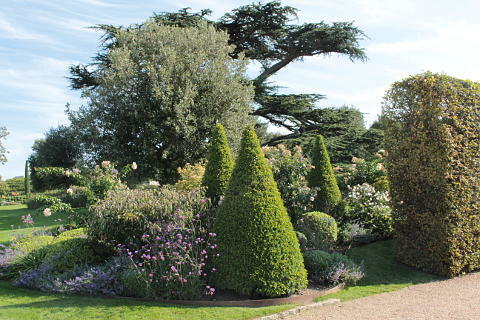 Clipped box cones and tall slender Italian cyprus add height and interest and at their feet the beds are planted with a relaxed mix of plants including geraniums and salvias. In some areas taller including white roses have been added to the beds and there is also an area of muscat vines. The colour scheme is a simple mix of green, grey and white with occasional blues and pinks to brighten the mix. Like so many gardens in France the box tree caterpillar is a menace and pheromone traps can be seen dotted throughout the box planting. The caterpillar of the box tree moth (Cydalima perspectalis) are causing lots of damage in French where box topiary is a key component of many gardens and traps and sprays are very much in evidence. 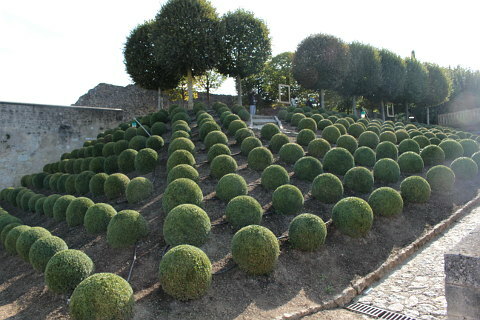 However at Amboise they obviously have it very much under control and the box balls and cones are in excellent condition! 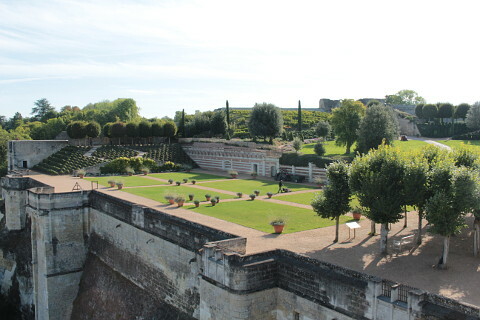 As you walk through the gardens you always have great views of the beautiful Chateau d'Amboise and also over the defensive wall to the River Loire and the town of Amboise below the castle. Both the castle and the town are well worth a visit. 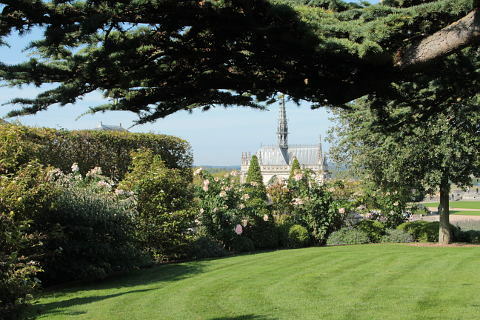 A new garden has been added in 2005, created by the artist-sculptor Rahid Koraichi and paying tribute ot Emir Abd al Kader's companions who died at Amboise. The geometric pattern of stone slabs is traversed by a green line of plants pointing to Mecca. 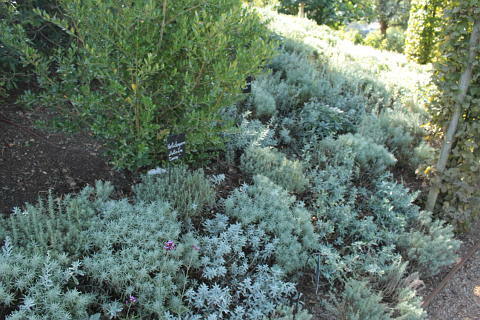 Rosemary, jasmine, cyprus and laurel have been planted as these are evocotive of both sides of the Mediterranean. 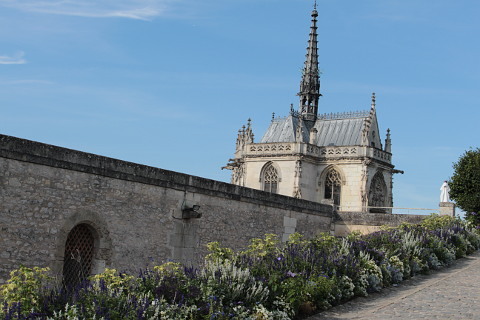 Interestingly the Chapel in the grounds is the burial place of Leonardo da Vinci who lived in Amboise from the age of 64 and asked the king if he could be buried in the St Florentin church in the chateau grounds. His request was granted and a bust in the spot marks the site. This church was demolished in the early 1800s and Leonardo's body moved to the Saint Hubert Chapel. 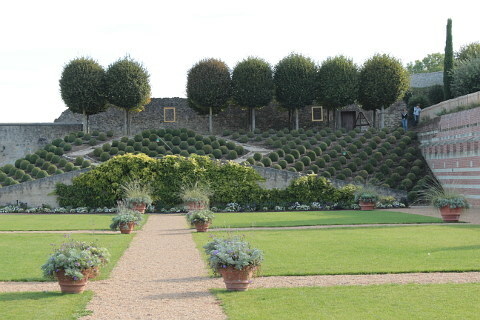 The castle and gardens are open every day except Christmas Day and New Years Day. Prices are 11.50 € for adults and 7.70 € for 7-18s. The beautiful Chateau de Chenonceau is nearby and well worth a visit for its beautiful design as well as for its gardens. 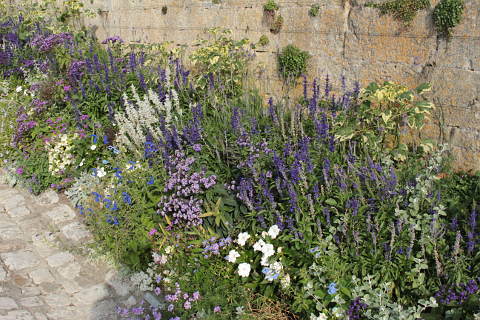 Every year the Chateau de Chaumont holds its International Garden Festival and draws thousands of visitors. The show gardens remain for most of the year but are best visited early on.